There's a bit of a guessing game taking place on a lot downtown, directly across Park Place from Bob Stern's super-galuxe Four Seasons Hotel, the 800-foot tower now under construction for Larry Silverstein and some of his well-traveled friends. 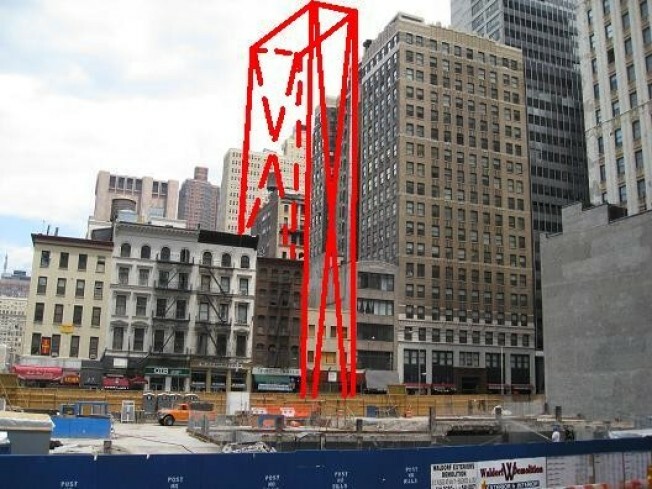 The site in question is 19 Park Place, a 25-foot wide through-block sliver in the shadow of the Woolworth Building, which also goes by the address of 16 Murray Street. Until recently it was 3-stories of 19th century brick, but it's now half-knocked down. And it seems there are a couple of architects competing to get something up and cash in on Park Place's new found cachet. About six months ago a New Building Application was filed by architect TC Ho, who also happens to be a sculptor and local businessman. Ho's plan is for 19-stories and 14 residential units. Then, within the month, a completely separate New Building Application for a 21-story 29-unit building was filed by architect Ismael Leyva, creator of things glassy, new and tall. Move forward a few months and neither Permit has been approved. Meanwhile a crew has started pulling down the old bricks of 19 Park Place, a building where Mark Twain once arranged his famous lecture tours and, more recently where one of those hard-to-find Duane Reade emporiums set up business. In between it was home to various editors, engravers and publishers. What will come next is anybody's guess. If anyone has the scoop the Curbed Tips Line is open and ready. We'll make sure to spread the word.